A bit of a Scots play on words there, but no matter. This morning I went into the village very early - I had a parcel to post. Our post office opens at 8:30, which is quite civilised really, and at present our local arts and music festival is on, which means things get very busy later on - especially since some genius has also decided this is just the time to dig up the streets in the town centre, and as a result we have parking areas coned off, temporary traffic lights - all that. So the early shift made sense. I got to the post office just after 8:30, did the necessary business and even had time and space for a quick chat with the manager. Heading back to my car I became aware of a minor stooshie developing across the road. Goodness me. It seems a wood-pigeon had flown into a window somewhere high above the street, and had fallen to the pavement, where it now lay, twitching, eyes closed, apparently gasping its last - opening and shutting its beak, anyway. The worst of it was that a middle-aged lady had witnessed the incident, and she was now in mid-conniption, shrieking and carrying on in fine style. Suitably alarmed, the staff from Greggs (the bakers, next door) came out and swept her into the cafe, and coffee was produced. Since there is not much else to gawp at so early in the morning, I suddenly found I, too, was in Greggs. I was idly wondering whether there might be some complimentary sausage rolls on the go as well as the coffee. The star of the episode was in full flow - sobbing. What distressed her most, she said, was that she couldn't help thinking that her husband would simply have broken the poor thing's neck, to put it out if its misery. It was only at about this point that the Greggs people realised that all this fuss was connected with an accident to a pigeon - the lady hadn't simply been taken ill.
A couple of us went out to see whether the tragic pigeon had died yet, but it was gone. The cause of all the upset appears to have picked himself up, shaken his head, and flown away. Probably a smart move. People never cease to amaze. All about a rat with wings as my wife calls 'em. Amazing. Hope the coffee was decent. I'm disappointed that the pigeons get such a bad rep in your part of the world. 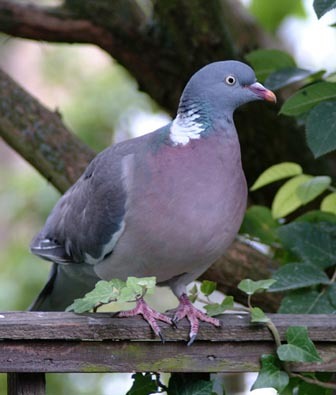 Feral (town) pigeons are more like flying rats, I guess, but our wood pigeons are fine big chaps - different thing altogether. Healthy country cousin. Also very nice with a warm salad and croutons and some beetroot. Of such things are tales made ... well I chuckled at least. Happy ending all round, apart from the lack of sausage rolls. The pigeon survived (though I doubt if it learned anything) and the lady got to be the centre of attention for about 15 minutes, and probably is due an Oscar nomination. 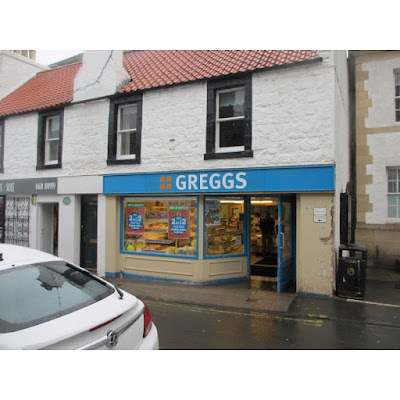 The Greggs staff can credit themselves with having performed an act of kindness, and a number of early visitors to the town got something to talk (or even blog) about. Shame about the sausage rolls, mind. Well that started my day in fine style, cheers Tony. All much too exciting for me, Lee. Hope things good with you. Ahh - the Gregg's sausage roll - Newcastle's haute cuisine - I really like those, very moreish baking. As for the woodpigeon, they taste very good as well. The Greggs sausage roll is the sort of thing you feel we ought to be snooty about, but it is real comfort grub, no argument. Only one, mind - a second one and my breathing gets muffled. Ah - yes - I think the "compensation" bit comes when she realises the hot coffee is actually hot. It's a nice idea, but I spoke to someone who had seen it fly off. You don't suppose it's working with the lady, do you? Do they tour the Scottish coast, mopping up the free coffee? I should notify the Daily Mail. I'm just surprised he didn't find his way into a chicken and mushroom pie......or did he? Good point - the men in the big white plastic suits will be calling on Greggs this morning to check. It'll be OK as long as they served it to a tourist.